Henry Percival Stanaway aka “Harry” was born in Tangowahine 13 May 1902 (Birth Certificate Number 1902/21160). He was the third child of Charles George and Elizabeth Stanaway. Not much is known about his childhood other than we could expect it to be the same as his siblings and other children in the area at that time. The first record we have is from 1925 when Harry marries Elsie Mary Chapman (Marriage Certificate number 1925/9171). We have an “Elsie Stanaway” death Cert 1983/36738 DOB 19 July 1900 aged 82 when she died also have birth about 1906 from BMD in Dargaville (Cert number 1906/8862) daughter of Richard Anthony and Emma Louisa Chapman we believe the Elsie’s are one in the same. The 1928 Electoral Roll has Harry living in Tangowhine and is listed as a Launch Proprietor. At some stage Harry and Elsie have a son, Ross (Birth Certificate unknown). From “Longwater – Historical Aspects of the Northern Waiora” by Stephen Fordyce on Page 198 A picture from the Matakohe Kauri Museum shows a F254 locomotive and a guards van under tow on barges between Pukehuia and Dargaville in 1932. The towing launch “Curlew” belonged to Harry Stanaway. In each of the 1935, 1938 and 1946 Electoral Rolls, we have Harry and Elsie living in (Victoria Street 1935 and by 1942 in Gladstone Street) Dargaville and Harry is listed as a Launch Proprietor. From the 1942 World War II Ballot List we have Harry listed as number 580006 living in Gladstone Street, Dargaville and listed as a Launch Proprietor. Harry was the captain of the notable steamer “Ruawai”. History was made by taking the rather decrepit steamer from Helensville to Auckland. She was in bad shape and in spite of many others forbidding the trip, Harry took her safely out of the Kaipara bar and into the Hokianga and finally getting her to Auckland. The year after the Marine Department closed their offices on the Kaipara harbour, a stirring departure was made from Helensville and her waterways, by the former river steamer, s.s. Ruawai. For over 5 years Ruawai had lain on the slip at Helensville north until bought by a company who intended to use her in and out of Auckland. After the sale of Ruawai, however, a certificate of her seaworthiness could not be obtained from the Marine Department and the vessel was forbidden to leave Helensville. In spite of this order, the new owners decided to risk life and prosecution and Ruawai did leave Helensville, on the evening of 7th January, 1948. It was quite an occasion. With a cabin mattress tied to the mast, train whistles blowing, car horns tooting and a tearful, cheerful crowd attempting to sing “Now is the Hour”, Ruawai pulled away from the wharf, the deep notes of her siren sounding a farewell to the town, the river, and the past. On this defiant voyage, which was of great interest to all in Helensville, s.s. Ruawai was commanded by Harry Stanaway, descendant of the first Kaipara pilot, James Stanaway. Among his volunteer crew of fourteen men he numbered the new owner of Ruawai, Robert Hammond and his brother, Norton Hammond, relatives of Captain R.C. Hammond who had once been a ship’s master at Kaipara and a manager of the Northern Union Steamship Company at Helensville. On the 8th January the 129-ton Ruawai made a safe passage out to the Tasman through the shoals of Kaipara but on the next day she had to put into Opononi, Hokianga Harbour, because of engine trouble. Here, a second detaining order was placed on the ship, but the crew resolved to go on. To do this, they had to replace their coal supplies with firewood from Rawene. With wood-stoked furnaces they steamed out to sea again. The peril-ridden vessel had not gone far from Hokianga when further engine trouble forced Captain Stanaway to return the boat to Rawene and there they stayed until spare parts were fitted. …. (in 1953) she was towed to the mouth of the Albany creek and all her useful timber was removed after which she was left for time to complete her decay. In the 1957 Electoral Roll we have Harry now living in Howick and is listed as a Tug Master. There is no listing for Elsie. It appears that some time between 1949 and 1957 Harry and Elsie separate and that in 1961 Harry has remarried a Marie T Draper (born Ewins) (Marriage Certificate Unknown). Marie Draper was the daughter of ….. born 22 July 1942. On 19 March 1962 Henry Patrick Stanaway is born followed by a daughter Jane on 17 August 1963. From the 1963 Electoral Roll we have Harry living at number 11 Rodney Street in Howick with Marie T Stanaway, he is lised as a Tug Master. Harry spent most of his life working on the Kaipara for himself, and also worked from time to time for other operators, including the well-known Rope Family enterprise, The Rope Shipping Company. Some of the small boats he skippered were the “Phyllis” and the “Curlew”. he made headlines when he undertook the transfer of the derelict 177 ton wooden steamer “Ruawai” from the Kaipara to the Waitemata. He landed himself in a pile of controversy with the marine Department when he undertook to be skipper for this voyage. Harry had two sons, Ross and Henry. Ross died following an accident while working for Parry Bros, and Henry is still in the marine scene, and is currently a tug master for Post of Auckland. Harry and Marie have a third child named Robert Percy, he was born 31 March 1964. On 27 September 1964 Harry passes away, he is burried in row 10 plot 134 of the Howick Public Cemetery in Auckland. 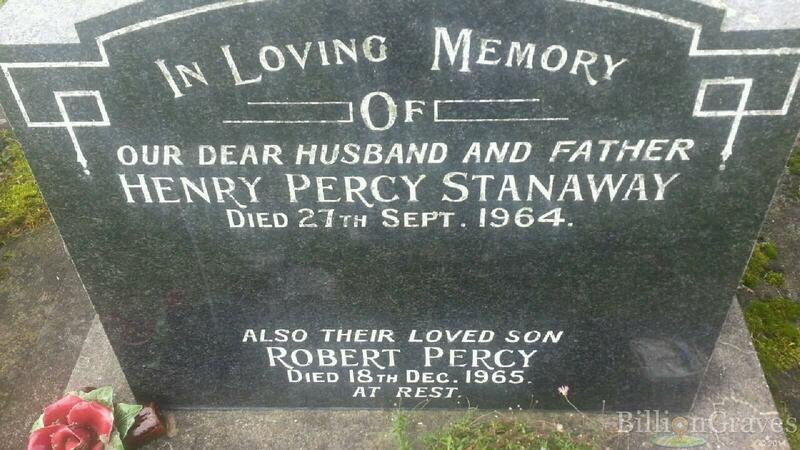 Harry’s son, Robert Percy died 18 December 1965. Robert is buried in the same plot as his father.